Walt and his team of artists, musicians, writers and animators say Adios! to the U.S. to explore the heart and soul of Latin America. In Saludos Amigos they travel to fun and exciting places and capture their adventures along the way. 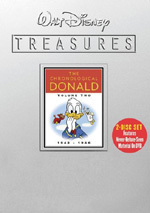 Next, it s Donald's turn to take a fantastic journey through these colorful lands with his friends Joe Carioca and Panchito in The Three Caballeros. With lighthearted dance and lively music, it s a celebration the whole family will enjoy! The Three Caballeros: 72 min. Although it may look that way, Disney weren't idle during the eight-year malaise. In fact, the studio released seven essentially animated pictures from 1943 through 1949, plus two other films - Song of the South and So Dear to My Heart - that included varying amounts of animated content combined with live action narrative but essentially fell into the latter category. However, none of these had that zip that made the prior - and subsequent - offerings so compelling, so the memory of these films is left to Disney-philes like myself. For two of Disney's Forties efforts, Walt and company looked to our neighbors to the south for inspirations; both 1943's Saludos Amigos and 1945's The Three Caballeros offer looks at various aspects of the cultures of Central and South America. Disney's reasons for doing this were less than altruistic. For one, the releases of pretty much all the animated films after Snow White coincided with some well-known unpleasantries in Europe; the advent of World War II effectively shut down those lucrative markets and put a serious monetary pinch on the studios. That wasn't a good thing, especially since these lavishly animated films were rather expensive. Of course, more than 60 years later, they all look like good investments, since they've returned their costs many times over, but at the time, all post Snow White films did relatively poorly and Disney had to tighten their financial belts. As such, both Amigos and Caballeros served two purposes. First, they were much cheaper to make. The animation went back to a more basic style that served the character-oriented shorts made by the studio; in fact, two Disney stars - Donald Duck and Goofy- would feature prominently in these films. Walt had famously declared that after the lavish efforts of their initial features, the studio would now only offer "meat and potatoes" animation, and these pictures were two of the first attempts at that kind of less ornate style. Happily for them, these films ended up more profitable than most of the prior efforts. That's probably due as much to the lowered costs as anything else, but the unfortunate lesson taken from them was to continue to stick with these sorts of projects for the foreseeable future. That's why Disney would not produce a film with a coherent plot until Cinderella in 1950; from Amigos through 1949's The Adventures of Ichabod and Mr. Toad, each and every feature was a compilation of shorts to some degree. I will note that some of the shorts were actually relatively long, as was the case with the two halves of Ichabod and a similarly bifurcated program with 1947's Fun and Fancy Free). I suppose it's ironic that projects like Amigos and Caballeros were more profitable than the classics that preceded them, since so few remember the "meat and potatoes" animation and so many love the more complicated creations. Nonetheless, I won't slam Disney for taking the path they did. Without the belt-tightening seen in these films, the studio may not have existed long enough to create all the wonderful movies that followed in the Fifties, and without those hits, we wouldn't still see new animated pictures today. For those reasons, we have to at least be thankful that Amigos and Caballeros found an audience in their day. But is there still one for these movies in our day? Yeah, I guess, though there's a good reason these films aren't viewed in the same light as their immediate predecessors and later followers. They're generally interesting and entertaining pieces of work, but the title "Disney Classics" seems like too much praise for them. Of the two, I definitely prefer Amigos. It's so short that it's hard to qualify it as a feature; 42 minutes is awfully brief, though Amigos was supplemented with other attractions during its theatrical run. However, this length seems just about right for this sort of offering; Caballeros runs for about a half an hour longer, and it gets quite tedious. Amigos really is little more than a conglomeration of short cartoons linked together by some live action footage that serves as a kind of travelogue. Mainly the latter features shots of the Disney animators as they tour South America, but we also see lots of the native folks doing their native folky stuff. These segments are mildly interesting, though mostly it's fun to see the Disney people. While none of them seem terribly entertaining, the dated nature of the material makes it more compelling. Since this project is more than 60 years old, it's kind of fun to get a look at different cultures during that time period. While the live action shots may be worth a look once or twice, it's the shorts that will keep you coming back to Amigos. The film contains four in all, and though some are better than others, they're all good. Also excellent is "Gaucho", though not quite as good as Donald's piece. This short seems to be part of the "how to..." series of Goofy cartoons – though not as explicitly "demonstrative" in nature - and it's a very entertaining look at the Goof's failed attempts to be a gaucho. I'm not much of a fan of Goofy and usually find his cartoons to be decent at best, but this one worked very nicely. My only complaint in regard to "Gaucho" is that it's been edited. A shot of Goofy puffing on a cigarette has been altered. Whereas in the original - and still visible on the deluxe laserdisc boxed set from the 1990s - Goofy briefly smokes, none of that is visible here. Instead, the cigarette has either been digitally removed from the image or the scene edited so that the offending portions are excised; this requires some repetition of animation as well as use of shots from other scenes. While I heartily endorse the notion that smoking is foul and bad for you and I understand that after the whole "Joe Camel" ruckus that companies are reluctant to appear to endorse smoking for youngsters, this is ridiculous. Amigos is not a promotional piece aimed at luring youngsters to the wicked ways of tobacco; it's a cartoon from more than 60 years ago, when attitudes regarding smoking were very different. This alteration – along with the others being made by Disney on features such as Melody Time (which also changes a scene of a character smoking) and Make Mine Music (which omits an entire cartoon) - is an unnecessary and insulting nod to "political correctness". The absurdity of the decision seems even clearer when one considers the audience that will most likely pursue this feature. For now, that's the end of my soapboxing - back to the cartoons. Two more remain on Amigos. The better of those two is the cute and charming "Pedro", a variation on "The Little Train That Could". It features a family of mail planes, and when Daddy takes ill, little Pedro tries to fulfill his legacy and deliver the mail. It's not as funny as the Goofy and Donald features, but it's still entertaining and delightful nonetheless. Second, "Aquarela" strongly foreshadows what we'll see in Three Caballeros. Like most of that film, "Aquarela" is much more conceptual and impressionistic; there's no true plot but it offers an abstract visual number accompanied by the short's title song. It can be quite bizarre at times, and it has some pleasures, though I'm not terribly enamored of the format. Nonetheless, Saludos Amigos offers some fairly charming pieces. It's rather short, but part of its effectiveness comes from the brevity; the format doesn't last long enough to wear out its welcome. Amigos isn't a classic, but it's an entertaining program. Saludos Amigos appears in an aspect ratio of 1.33:1 on this single-sided, double-layered DVD; due to those dimensions, the image has not been enhanced for 16X9 televisions. This was an adequate transfer. 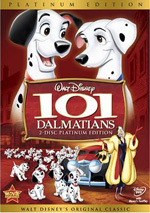 The movie is composed of two different elements: the standard animated scenes and a number of 16mm live-action sequences. The live action parts uniformly looked a good deal worse than the cartoons. The main issue for the live scenes was sharpness; the flick seemed soft and fuzzy for all of these shots. Colors were somewhat faded but not bad, and the print suffered from few faults. Black levels were surprisingly deep, though, and shadow detail seemed adequate. The animated portions definitely looked better but they had some issues as well. Sharpness seemed very good for the cartoons; all of those clips were crisp and well-defined with no signs of softness. I noticed no resulting moiré effects or jagged edges either. The print itself continued to look pretty clean and fresh for such an old movie; I saw some dust on the cels but otherwise found few flaws. I did, however, witness a vaguely flickering quality to the image at times; this seemed most prominent during the "Aquileros" cartoon, but was also present at other times as well. Colors were also improved for the animated sequences. They appeared pretty bright and bold with no evidence of bleeding or noise. Black levels seemed deep and dark, and shadow detail continued to look nicely opaque but not overly solid. Amigos had some problems but I generally thought it provided a decent image. The same could be said for the Dolby Digital 5.1 audio. Amigos provided a remix of the original monaural track that did little to open up the image. This was a “broad mono” presentation that spread some music and effects to the sides in a minor manner. No concise localization appeared, as the elements simply broadened to the sides – and a little to the rear – without any precision. It wasn’t a distracting soundfield but it seemed like a pointless reworking of the original mono. Quality seemed reasonably good, though not anything special, even for the era. Dialogue appeared pretty clear and relatively natural, though I noticed a slight amount of distortion at times. Music lacked dynamic range but seemed smooth and clean. Effects were also a bit thin but appeared reasonably realistic and crisp. It seemed like a pretty typical effort for the early 1940s. As for the set’s extras, I’ll discuss them at the end of the Caballeros review. Three Caballeros remains one of my least favorite Disney features. The film starts out much like Amigos in that early on we find two shorts that would easily have meshed with the earlier piece. There's "Pablo", a story of an Antarctic penguin who just doesn't like the cold. The cartoon depicts Pablo's attempts to move to where the sun shines, and it's more cute than funny but I liked it nonetheless. The next short - "The Gauchito and His Burrito" - also seems similarly charming but not especially laugh-filled. It offers a fantasy in which a young boy tries to win a horse race with a flying donkey. It's entertaining and likable. At this point, only one significant difference exists between Amigos and Caballeros: the latter dropped much of the live action footage in place of transitional scenes that show Donald Duck. It seems it's the Duck's birthday and he's received a present of some South and Central American materials, the foremost being a movie projector and screen; that's where he finds the aforementioned cartoons. After those two shorts, however, Jose Carioca springs up and the film takes a very different turn. At that point, the entire project veers into the same direction as the "Aquarela Do Brasil" segment in Amigos. Caballeros essentially becomes an elaborate, story-free musical that depicts songs and culture in which Donald, Jose and Panchito - a manic new character who appeared only in this film and who rounds out the group to make them the three caballeros - romp through various scenarios. They sing songs and interact with others who dance and sing as well. To be frank, I find these sequences clever and inventive and well-executed but ultimately tiresome and uninteresting. Much of the picture seems repetitive; no, the songs and sequences aren't identical, but they look enough alike that they all start to run together. The style worked well enough for the short in Amigos, but it receives too much emphasis here and the entire project goes downhill because of it. At least Fantasia offered some widely varying styles, but the same does not occur here and I honestly have a hard time making it through this film. One notable aspect of these scenes comes from the technology used. Many of the musical sequences of Caballeros combine live action characters and animated personalities. We think nothing of this today, but 60 years ago it was a big deal. Essentially two techniques were used. Some scenes involve rear projection; the animation was completed first then projected while the live actors worked in front of it; this works decently well but suffers from the degradation of the animated image, as it now becomes second generation. Still, considering my modern eyes are much more sophisticated in terms of special effects viewing than would have been expected at the time, the scenes work well. The other technique seems even more successful. In those instances, the live footage was shot first and the animation was composited on top of it. This method helps eliminate the fuzziness found on the rear-projected scenes, and it makes the characters integrate better with the actors. Of course, it's also more complicated and expensive, which is why it wasn't used exclusively. In any case, the technological strides made by Caballeros were big and the film uses them effectively. It's too bad the movie itself is a bit of a dud. Caballeros is well-executed and technically proficient, but that doesn't alleviate the fact the material itself gets old pretty quickly. Saludos Amigos offers enough fun to withstand repeated viewings, but Three Caballeros is something I probably won't revisit too many times in the future. The Three Caballeros appears in an aspect ratio of 1.33:1 on this single-sided, double-layered DVD; due to those dimensions, the image has not been enhanced for 16X9 televisions. The transfer mixed positives and negatives to become generally mediocre. Sharpness usually looked pretty good, with most images appearing crisp and well-defined. Some softness crept in to the animation at times, however, and things weren't as clear as one might expect. 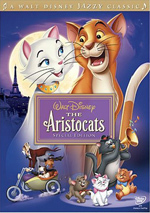 The softness reached its greatest extreme during the scenes that combined live action and animation; in many of those instances, the cartoon characters appeared fuzzier and less distinct than at other times. Nonetheless, these segments actually seemed better defined than I'd expect; rear projection often resulted in some big problems, since it essentially means that one part of the picture was now a second-generation piece, so these parts may be flawed, but they could have been much worse. I discerned no moiré effects or jagged edges. The print itself offered more flaws than I expect from Disney efforts. I witnessed a fair amount of light speckling throughout the movie. I couldn't find evidence of any other problems like scratches or hairs, however. Colors appeared generally strong, with adequately bright and saturated hues. At times they seemed a bit noisy, but not to an extreme. Black levels looked good, with some nicely dark and deep tones, and shadow detail seemed similarly positive. For a film its age, Caballeros looked decent, but I must admit I've come to expect better than that from Disney's animated features. As with Saludos, Caballeros underwent a Dolby Digital 5.1 remix. Also as with Saludos, the results were less than scintillating. Actually, I thought the music of Caballeros opened up a bit more, as the side speakers seemed a little more active and showed a few minor examples of actual localization. However, these instances remained rare, and the overall impact was still one of glorified, broad mono. The expanded soundfield added nothing to the experience. The audio seemed typical of the period. Music and effects were fairly thin and lacked dynamic range but they appeared reasonably clear and smooth without any shrillness. Some speech appeared a little edgy and rough, but most of the lines showed acceptable clarity and intelligibility. This was an average track for its age. We find a smattering of supplements here. Under the “Backstage Disney” banner, two components can be found. South of the Border with Walt Disney runs 33 minutes, 18 seconds. While I'm very happy to have this piece as a historical document, I can't say that I found it terribly interesting. For all intents and purposes, it's a glorified travelogue that does nothing more than introduce audiences to the lands depicted in Amigos, something the movie itself does well enough on its own. We do get a few nice shots of artists but these occur far too infrequently to entertain animation fans like myself. I was interested to note that famed conceptual artist Mary Blair was something of a babe, but other than that, I gleaned no useful information about the folks behind the scenes. It's worth a look as a curiosity but it probably won't be something you'll want to watch again. Next comes an excerpt from a Walt Disney CBC Interview. In this one-minute and 46-second clip, Shot in the 1960s, it appears, Walt talks about the genesis of the Amigos project and a few of its elements. He offers a quick primer but not much more. Contrary Condor (1944, Jack King): Donald heads to the Andes to find a giant condor egg, but he ends up as Mama Condor’s surrogate child. With its narrator and instructional tone, “Condor” reminds me a little too much of the Goofy “How to…” shorts. It also suffers from too much cuteness. I don’t see it as a particularly strong Donald effort. 4/10. A few ads open the DVD. We get clips for Sleeping Beauty, WALL-E, The Jungle Book 2, Disney Movie Rewards and 101 Dalmatians II. These also appear in the Sneak Peeks domain along with promos for The Little Mermaid: Ariel’s Beginning, Little Einsteins: Flight of the Instrument Fairies and Handy Manny: Manny’s Pet Round Up. 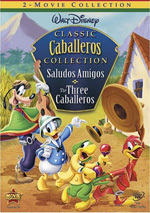 In a strange – and disappointing – choice, this DVD drops the theatrical trailers for both Saludos and Caballeros that appeared on the prior DVDs. By no stretch of the imagination is Saludos Amigos a classic piece of Disney animation, but it provides modest entertainment. Three Caballeros is a mildly entertaining program that has some high points but often drags and seems monotonous. For both films, the DVD provides erratic but acceptable picture and audio along with a few minor extras. This is a good set for Disney fanatics to own – especially with a reasonable list price of less than $20 – but it remains best left to the die-hards.